Hassiba Boulmerka - Who is Hassiba Boulmerka? Born in Constantine, Algeria, Hassiba Boulmerka started running as a young girl in her homeland's mountainous terrain. With her family's support, she won Algerian and Continental titles from an early age. She is the first Arab woman to win a world track championship. She has had to face criticism and threats from extremists, but insists that her participation in athletic competitions does not contradict her commitment to Islamic values and religion. Covering her legs, she says, would slow her down as a runner. Her first major international tournament was in the 1988 Olympics in Seoul, where she was eliminated in the preliminary heat of both the 800m and 1,500m. Boulmerka's breakthrough came in 1991. She scored an upset victory in the 1500m race at the World Athletics Championships in Tokyo. She sprinted to victory on the last straight, becoming the first African woman to win an athletics world title. When she returned to Algiers, she was hailed as a national hero and as a model for Arab women who wanted to break away from restrictive roles. But she was also condemned by Islamic fundamentalists. She moved to Italy to train and she followed up her performance in Tokyo with Olympic gold in the 1500 m race, at the 1992 Barcelona Games. Two hundred meters from the finish and behind the Russian Lyudmila Rogacheva, Boulmerka cruised to victory to become the first Algerian to win an Olympic title. 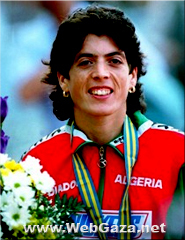 Hassiba Boulmerka won a bronze medal in the 1500-metre race at the 1993 World Championships in Stuttgart. In 1995 she won her second title at the World Championships in Gotheburg. She competed at the Centennial Olympics in Atlanta, but sprained her ankle in the semi-finals. After the 1997 season, she retired from sports but Boulmerka is still active promoting the cause of women athletes and openly challenges barriers faced by female athletes. Hassiba Boulmerka is one of the first people to be directly elected to the Athletes' Commission of the International Olympic Committee.